Constantly delighted and inspired by constructal law and the incredible shapes, patterns and vibrancy found in nature, Kate Halfpennyʼs exquisite new collection, The Garden After the Rain, invokes memories of fresh, crisp scented air, lush greenery and delicate, dewey blossoms. Kateʼs famous fabric knowledge and self-confessed obsession is demonstrated splendidly once again. Heavily inspired by her lifetime botanical love affair, the new wedding dresses and bridal separates feature delicate floral laces, hand-crafted cross stitched blooms and extravagant palm appliques alongside graphic honeycomb and elegant silks with a fringed flourish. 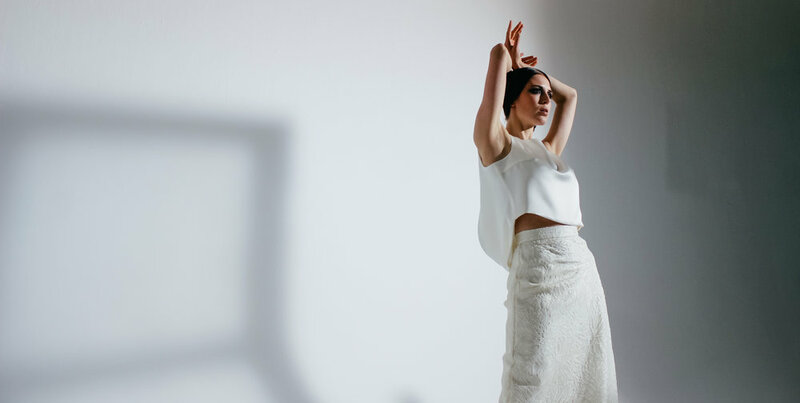 With The Garden After the Rain, expertly tailored, clean lines sit alongside unexpected twists on classic silhouettes as Kate boldly continues to blur the line between fashion and bridalwear with astonishing, striking pieces for the modern bride.